Novak Djokovic reached the Dubai Championships final, storming past fourth-seeded Juan Martin del Potro 6-3, 7-6 (4) in a match marred by a time violation call on Friday. Djokovic will face either defending champion Roger Federer or third-seeded Tomas Berdych. 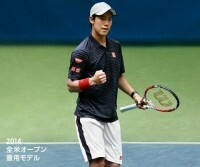 Kei Nishikori: Will he be the first Asian to win a Men's Singles Grand Slam?